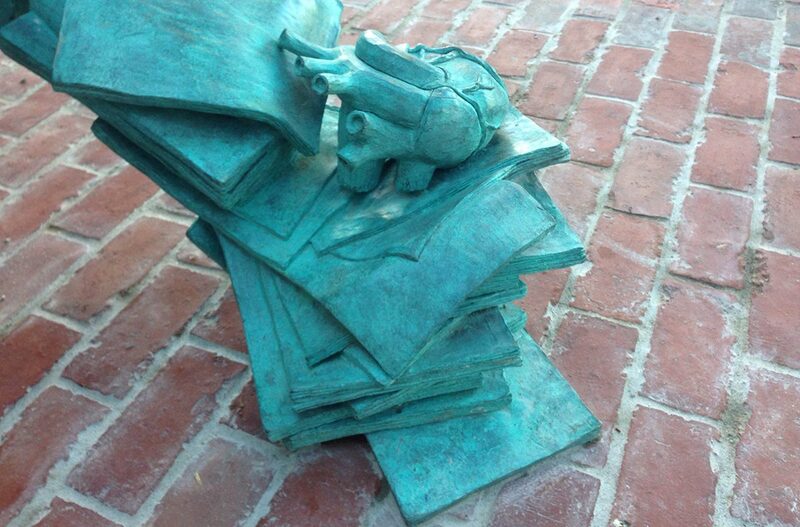 A life-sized statue of the surly author was unveiled during a ceremony this weekend. By Steve Annear·	 10/6/2014, 10:25 a.m. 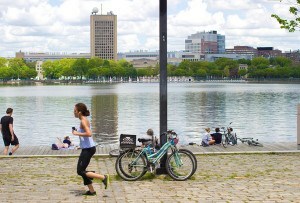 It started with the sale of miniature bobble heads of the author, in order to help fund the project, and ended with a life-sized re-creation of him striding through the city’s streets, briefcase in hand. 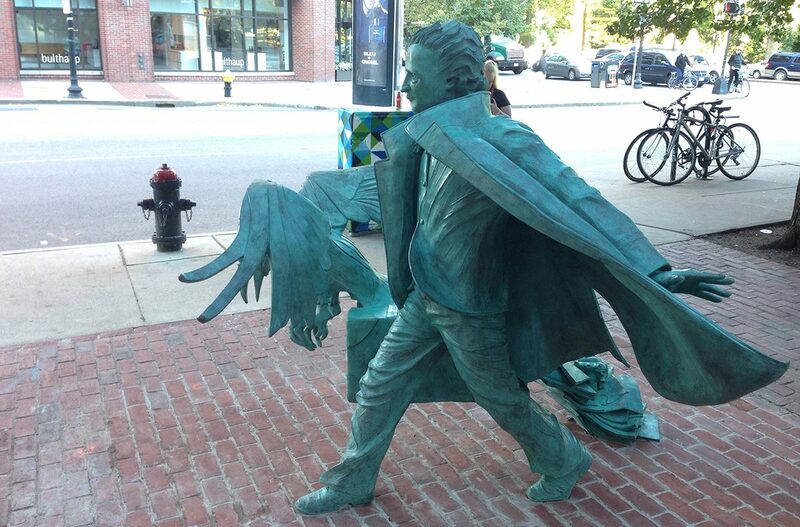 During the weekend, members of the Edgar Allan Poe Foundation of Boston officially unveiled the long-awaited statue of the tortured writer paying homage to a literary phenomenon, known for his dark, twisted personality and craft, who once called Boston his home more than 100 years ago. 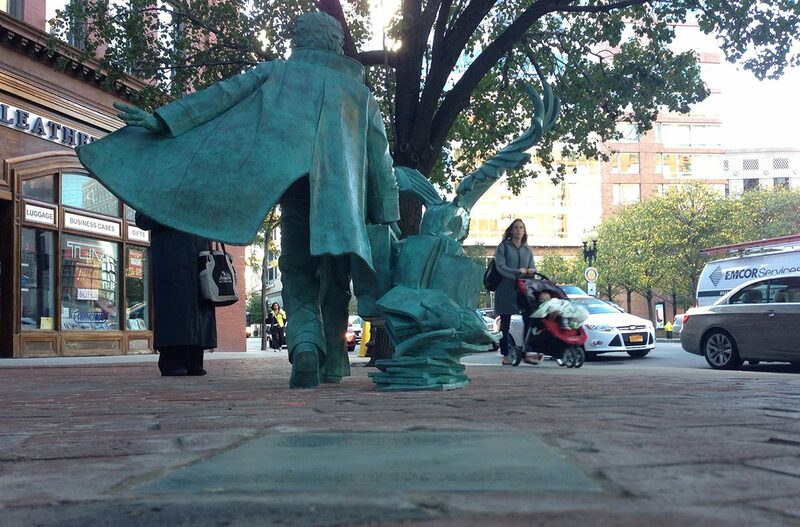 The statue, a bronze-based figure carved to look as though Poe is rushing down Boylston Street at the intersection of Charles Street South, a small section of the city that was dubbed “Edgar Allan Poe Square” by former Mayor Tom Menino’s administration, was created by artist Stefanie Rocknak, and is flanked by bits of paper falling from the author’s briefcase. Flying next to Poe is a giant raven, bursting from his baggage. 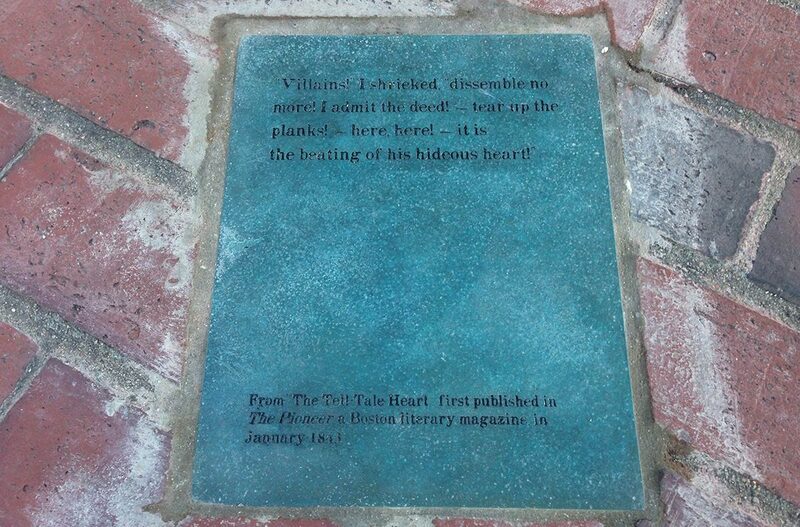 A heart, representing his well-known work The Tell-Tale Heart, is plopped on a pile of books behind Poe’s flowing coat. 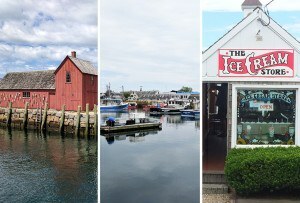 Rocknak was first selected to create the statue in 2012 after a five-member selection committee formed by the Edgar Allan Poe Foundation of Boston, the non-profit group that’s backed the project from day one, sifted through design proposals from 265 artists from around the world. 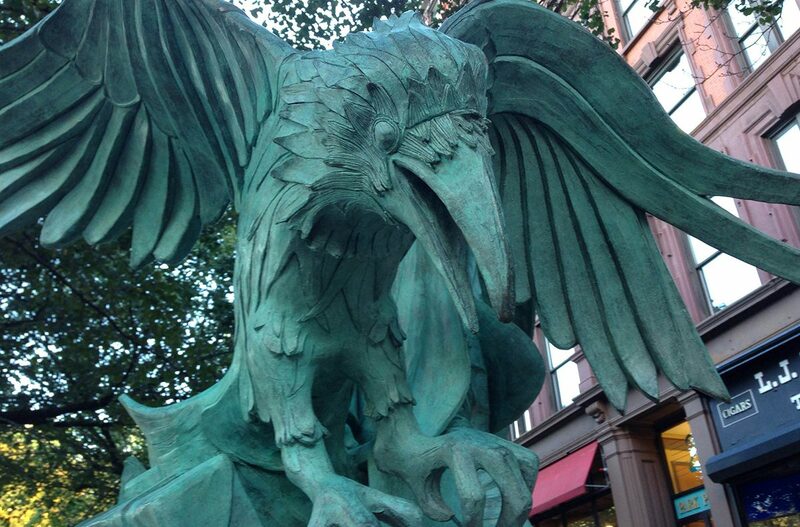 If the statue isn’t enough for feverish Poe fans, there’s more to come. 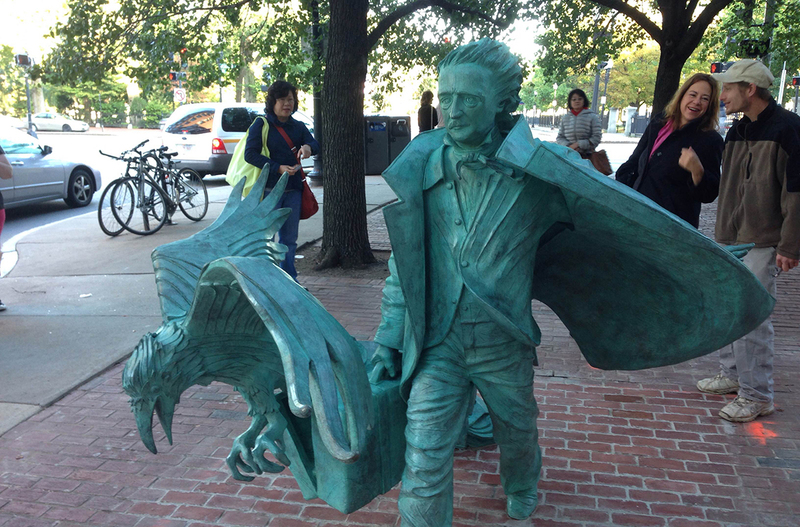 At the end of the month, a separate group, called the Edgar Allan Poe Bronze Bust Project, will unveil their own small-scale statue at the Boston Public Library. 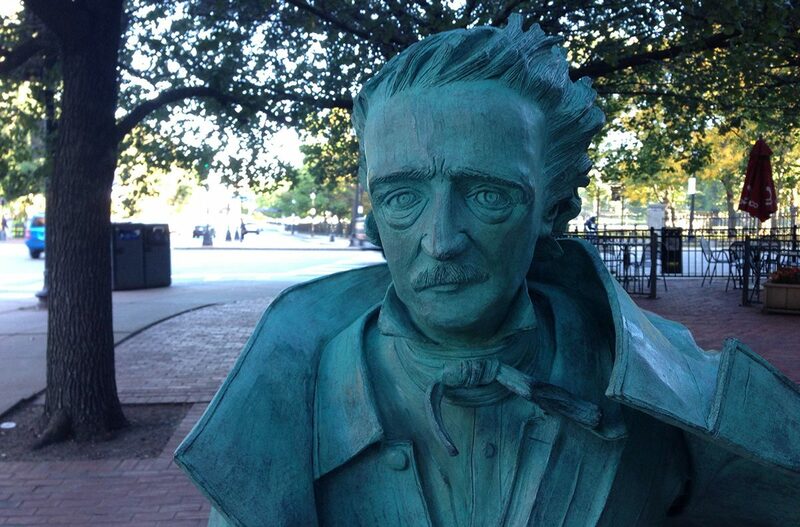 On October 30, sculptor Bryan Moore will celebrate Poe with a bust that is similar in style, and was funded with the help of big name celebrities like author George R.R. Martin, and director Guillermo del Toro. A day after that unveiling, on October 31, actor Jeffrey Combs will reprise his role of Poe for a one-man show at the Somerville Theatre in Davis Square.